Riberalta is a small town in northern Bolivia in the Amazon valley. 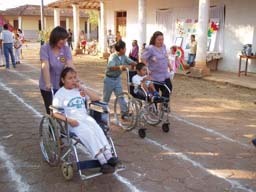 Physically retarded children and teenagers are brought daily to the Centro de Nuevo Horizonte. A group of young people from Germany are supporting and caring for the children in order to bring them to the point where they can learn to do such normal activities like sitting, standing and moving. Due to their catastrophic financial situation, there is a huge shortage of wheel chairs, crutches and prostheses. We are convinced that this is a worthy project and intend to support them in the long term. As there were mainly in-kind contributions, the money from Charity Cat was used for the very expensive freight costs from Germany to Bolivia. These generous donations helped the project to be planned and implemented within a year. In the two pictures you can clearly see the difference. The first photo shows Juan (back right) who had to be transported in a wheelchair. This wheelchair is far too big and therefore Juan has no chance to maneuver it on his own. 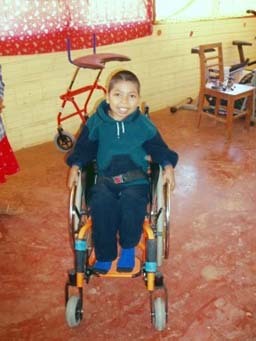 Now in addition to independently steering the children can also sit unaided in the wheelchair. As long as the children were not able to sit without help they usually had to remain in a hammock all day. Now the children in the Centro de Nuevo have the chance to know the world from a totally different point of view.